It's been an exciting start to the year here at Precise Petcare! We're developing and improving the features our customers are talking about most. Have an idea for a feature you'd like to see? How about a topic you could use more education on? Let us know! We're here to make sure your business flourishes every day. You can now setup a different Auto Invoicing schedule for visits which are part of Ongoing series. This is done from the Billing > Billing Options > Auto Invoicing (Ongoing Only). If you have a client who you want all of their visits to use this new invoicing schedule set Auto Invoicing to "Use Ongoing" in their profile. Bonus feature: Use the "Preview" button when configuring Auto Invoicing to see a projection of the next auto invoicing. When you're in the Schedule tab of a Client Profile there is a box that shows a list of that client's ongoing series (click to toggle open). This will allow you to quickly see and make changes to that client's series without needing to locate the visits on the schedule. Clients can also see it on their My Schedule page. There is now a button that allows clients to make their own pets inactive by marking them as such. You will get an email when this happens which will include a message from the client, if they add one. The pet is immediately set as inactive so no action is necessary on your part. We have added Stripe as a supported gateway and you can set it up yourself on the Billing > Billing Options > Online Payments page. Click on the "Connect with Stripe" button and you will have the option to either connect to your existing Stripe account or setup a new one. That's it! You can also configure Authorize.net, PayPal Payments Pro and Payeezy on that same page. More information can be found in the support article. The Ongoing Series editor now allows you to selectively change specific series settings. 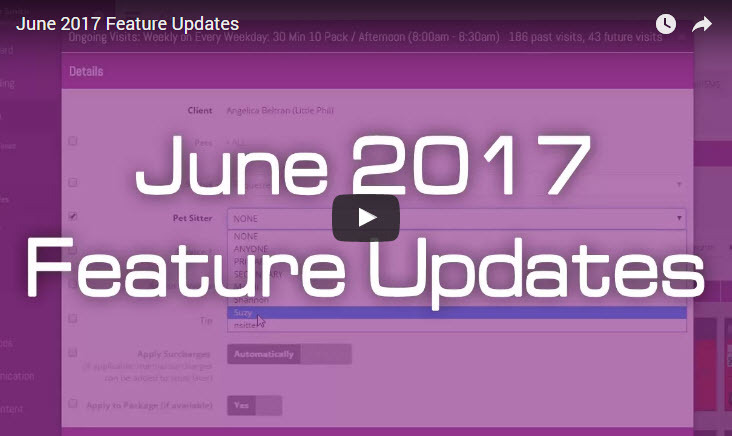 This will mean that future visits are no longer overwritten with changes after the Effective Date. I've worked in several businesses, so I know the difference truly great software can make. Precise Petcare is hands down the best I've used, with a fantastic interface, constant updates, and a prompt, friendly staff always ready to help. I couldn't recommend it more for any petsitting business, regardless of size.